The femoral triangle is a hollow area in the anterior thigh. Many large neurovascular structures pass through this area, and can be accessed relatively easily. Thus, it is an area of both anatomical and clinical importance. In this article, we shall look at the borders, contents and clinical correlations of the femoral triangle. 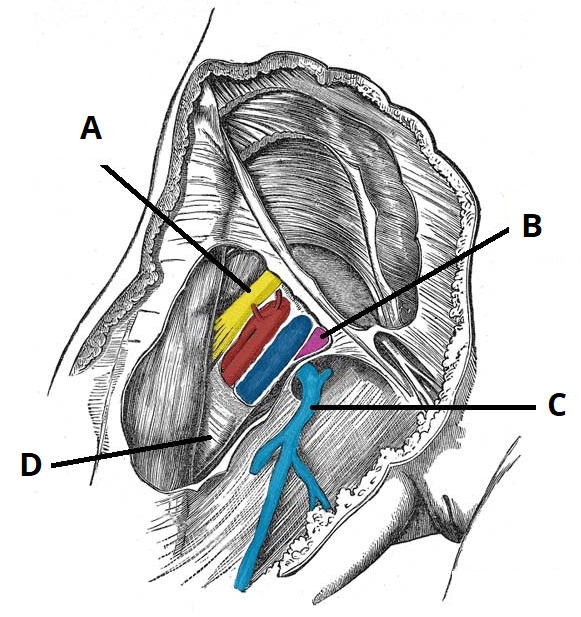 Fig 1.0 – Surface anatomy of the femoral triangle. Superior border – Formed by the inguinal ligament, a ligament that runs from the anterior superior iliac spine to the pubic tubercle. Lateral border – Formed by the medial border of the sartorius muscle. Medial border – Formed by the medial border of the adductor longus muscle. The rest of this muscle forms part of the floor of the triangle. 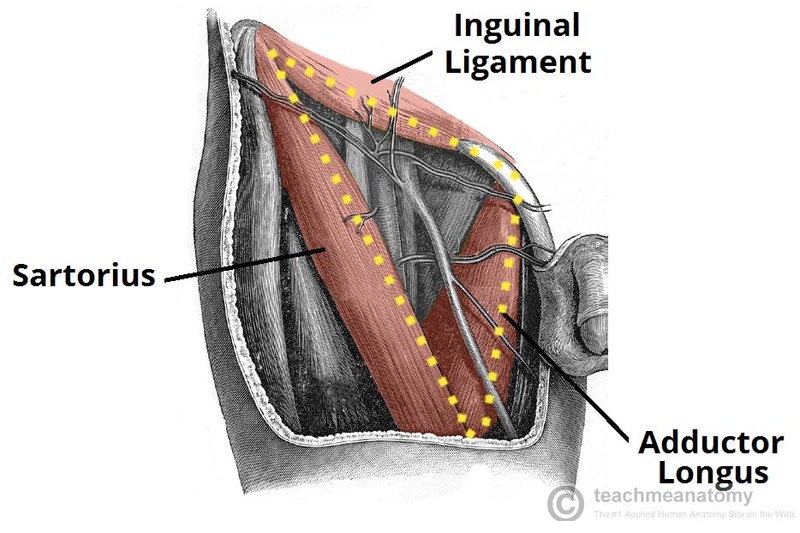 Note: Some sources consider the lateral border of the adductor longus to be the medial border of the femoral triangle. However, the majority state that it is the medial border of the adductor longus – and this is definition we have gone with. Anteriorly, the roof of the femoral triangle is formed by the fascia lata. Posteriorly, the base of the femoral triangle is formed by the pectineus, iliopsoas and adductor longus muscles. The inguinal ligament acts as a flexor retinaculum, supporting the contents of the femoral triangle during flexion at the hip. Fig 1.1 – The borders of the right femoral triangle. Femoral nerve – Innervates the anterior compartment of the thigh, and provides sensory branches for the leg and foot. Femoral artery – Responsible for the majority of the arterial supply to the lower limb. Femoral vein – The great saphenous vein drains into the femoral vein within the triangle. 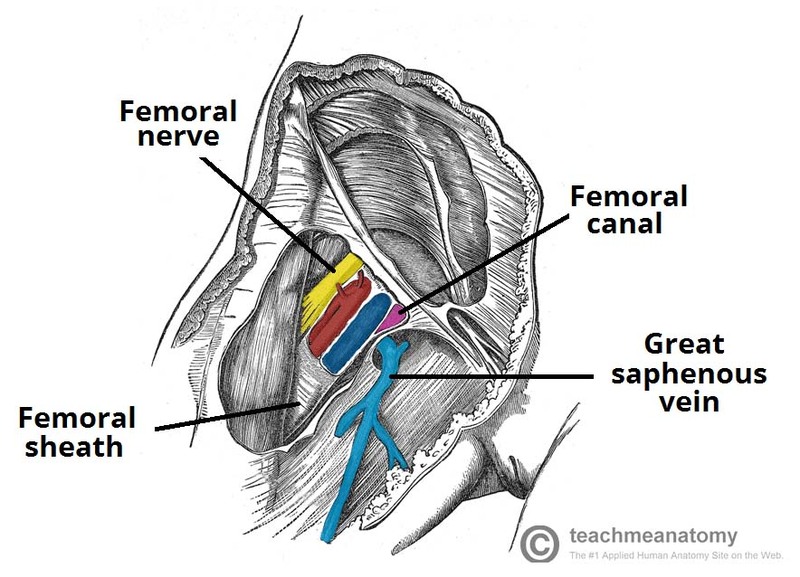 Femoral canal – A structure which contains deep lymph nodes and vessels. The femoral artery, vein and canal are contained within a fascial compartment – known as the femoral sheath. Fig 1.2 – The contents of the femoral triangle. E: Empty space (this is important as it allows the veins and lymph vessels to distend, so they can cope with different levels of flow). Just inferior to where the femoral artery crosses the inguinal ligament, it can be palpated to measure the femoral pulse. The femoral artery crosses exactly midway between the pubic symphysis and anterior superior iliac spine (known as the mid-inguinal point). The femoral artery is located superficially within the femoral triangle, and is thus easy to access. This makes it suitable for a range of clinical procedures. One such procedure is coronary angiography. Here, the femoral artery is catheterised with a long, thin tube. This tube is navigated up the external iliac artery, common iliac artery, aorta, and into the coronary vessels. A radio-opaque dye is then injected into the coronary vessels, and any wall thickening or blockages can be visualised via x-ray. A hernia is defined as “a condition in which part of an organ is displaced and protrudes through the wall of the cavity containing it“. In the case of femoral hernia, part of the bowel pushes into the femoral canal, underneath the inguinal ligament. This manifests clinically as a lump or bulge in the area of the femoral triangle. It usually requires surgical intervention to treat. In this diagram of the femoral triangle, which structure corresponds to the label ‘C’? Which structure forms the lateral border of the femoral triangle? Listed below are the contents of the femoral triangle. Which is located most medially? More questions are available for this quiz if you support us here or upgrade your support level in your account. You need to be a supporter to access this content. Please support us here or upgrade in your account. 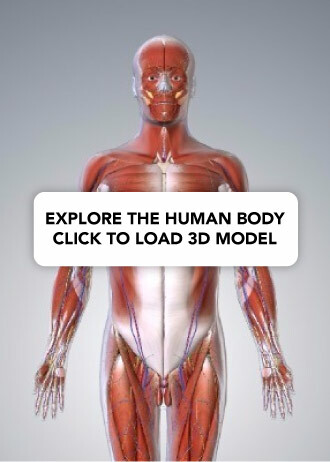 The medical information on this site is provided as an information resource only, and is not to be used or relied on for any diagnostic or treatment purposes. This information is intended for medical education, and does not create any doctor-patient relationship, and should not be used as a substitute for professional diagnosis and treatment. By visiting this site you agree to the foregoing terms and conditions. If you do not agree to the foregoing terms and conditions, you should not enter this site.